Basalyga sat in his office in 1979. He was also the quarterback coach for the Turpin football team and the baseball coach at the time. The phone rang in his office and at the other end of the line he hears the voice of the athletic director. The athletic director proceeded to tell Basalyga that the soccer coach at the time had quit and asked Basalyga to become the next head coach. In his first weeks as coach, he coached as if they were a hockey team; physical play and mental toughness were placed at the core of his coaching regime. In his first few games, Basalyga substituted players after every goal, much like hockey teams do. Basalyga struggled for two years trying to coach soccer like a hockey team. He started reading books. “My daughter was two and three. I would read a book, watch some videos, and then teach her what I was reading. She was my guinea pig,” Basalyga said. Lindsay remembered her dad going to coaching conventions and loved when he would back new equipment for she and her siblings to try out. Basalyga turned those days into a 325-93-58 record at Turpin High School, including three Ohio state championships in 1986, 2000 and 2001. During this period, he was also coaching ice hockey in the winter at Moeller, coaching baseball in the spring and coaching his children’s teams. Basalyga originally applied to NKU to become the head coach of the women’s soccer team in 1997. 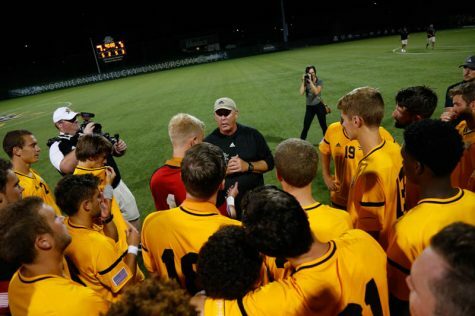 Jane Meier, former athletic director at NKU, instead hired another Cincinnati high school coach, Bob Sheehan, to run the women’s soccer program. Meier didn’t forget about the Turpin head coach though, and when the men’s head coaching position opened up in 2003, she knew just who she wanted to lead the team. Basalyga talks with his 2016 Norse team after a victory. Basalyga said he owes his career to Meier. In his first season as head coach, the Norse went 4-9-3 on the season, and some players started grumbling about how hard Basalyga was pushing them. It was the only losing season in Basalyga’s DII career. The Norse went 12-6-2 the next year, and the grumbling ceased, from what Meier could tell. 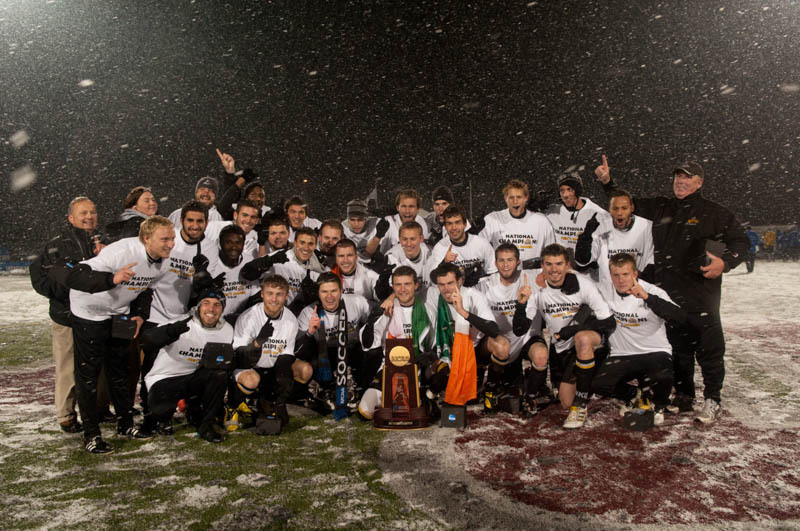 In 2006, the Norse went 16-3-3 and were Great Lakes Region champions. Basalyga’s teams continued to improve after each season, but needed something more to get to where Basalyga dreamed. Enter Steven Beattie, a talented, goal scoring forward from Dublin, Ireland, who would later be drafted by Toronto F.C. and now plays professionally for Cork City F.C. in Ireland. Beattie first met Basalyga in Memphis, when the coach came marching across the field after Beattie’s Irish team finished playing in a showcase. Even still, Beattie and Basalyga connected quickly, and the Dublin native committed to NKU and arrived on campus in 2007. Beattie compares his first practice with Basalyga to the scene in the movie “Miracle”, where the 1980 US National hockey team is speed skating back and forth and the Kurt Russell version of Herb Brooks repeated tells his team to get “on the line”. 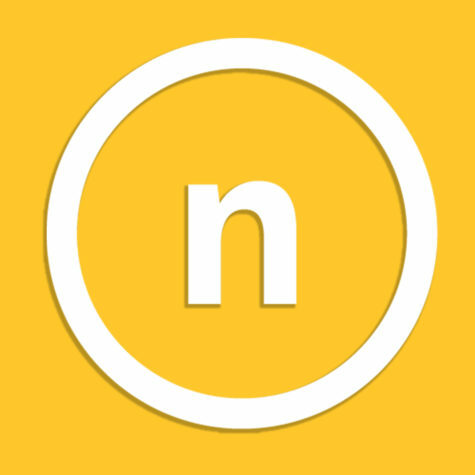 The Norse, however, were practicing outside in the blistering summer heat. Basalyga’s intensity was the same during practice as he was in games. “I dared kids to quit,” Basalyga said. This was directed towards the referees as well, and those interactions were tense at times. “One time the referee told him to shut up. So he (Basalyga) taped up his mouth so he couldn’t talk in the middle of the game,” Beattie said. When the team made the transition to DI in 2011, Basalyga made his team play for an hour and 20 minutes straight. One team was winning by two goals. At the 45 minute mark Basalyga told his team that the next goal would win. The team played another 45 minutes. That practice happened on a Tuesday. The next game was on Friday. The Norse played Stetson and were getting beat in the first half. In the 88th minute though, the Norse scored to tie the game to send the game to overtime. The Norse scored in double overtime to seal the comeback victory. In 2010, the Norse exploded once again, recording a 20-2-3 record on the season, vaulting them to the DII National championship game in November. In the weeks leading up to the national championship, Basalyga banned the team from wearing long sleeves, pants, or any warm weather gear despite brutal cold, snow, and ice. In fact, the snow was so bad the day of the national championship kickoff was delayed for over an hour to clear snow off the field. 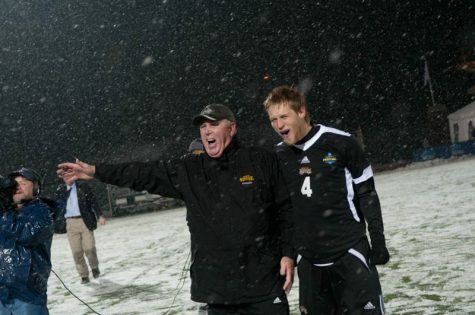 Rollins College, the Norse opponent, was a Florida team and never had to play in the snow prior to this game. The Norse took the field the same way they had been practicing for weeks; short sleeves and shorts. 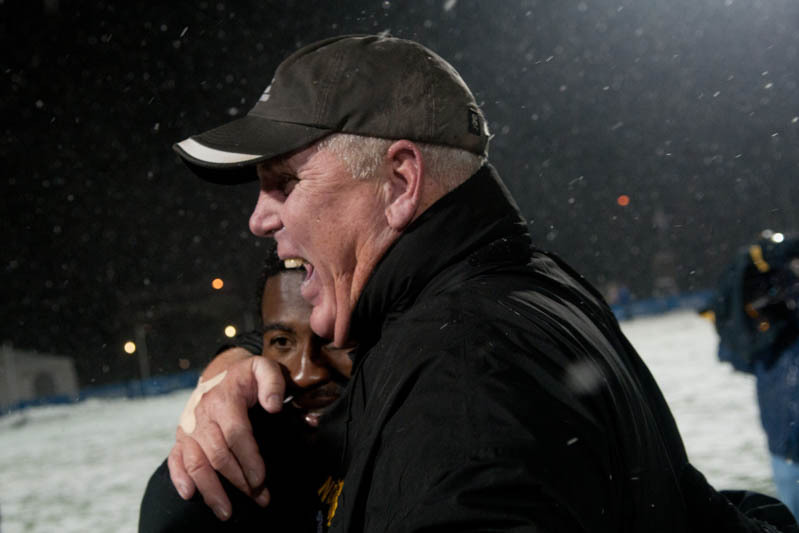 “People were like this guy is crazy, this NKU coach is crazy,” Beattie said. “There is method to his madness, you don’t even feel the cold. The other guys come out for warmups with big jackets and tights on and everything else. Everything he did he had a plan. Basalyga’s madness resulted in a 3-2 victory over Rollins to collect the 2010 DII National Championship, something Beattie told his coach the first week on campus they would accomplish.